Orange Picnic and Fireworks Spectacular on Aug. 22! • On-site food carts and BridgePort Brewing beer garden featuring the new Tilikum Crossing Orange Line IPA. • Salt & Straw will unveil its special-edition orange-themed Olive Oil & Burnt Orange Marmalade ice cream. • Live family-friendly music played throughout the evening. 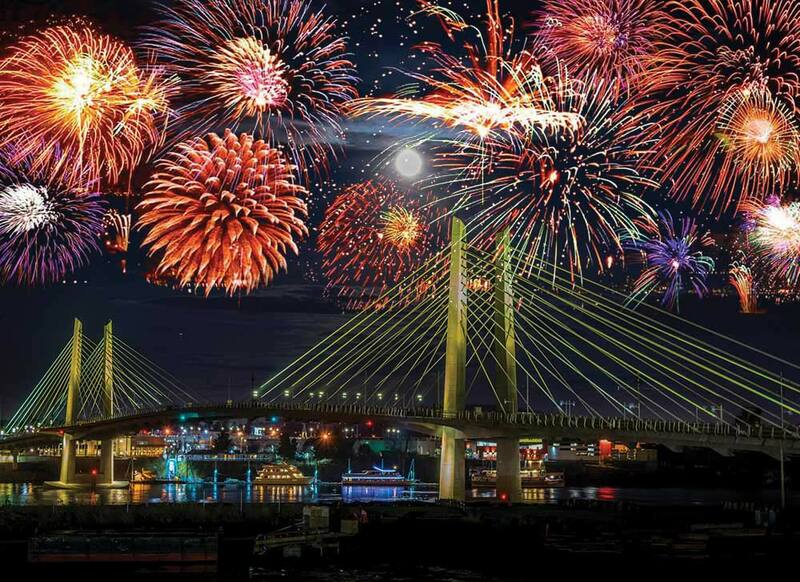 The Fireworks Spectacular will be a once-in-a-lifetime event with fireworks displayed off the deck of Tilikum Crossing, Bridge of the People, around 9 p.m. It will be one of the biggest and best fireworks show in Portland. The picnic area is on a gravel surface, so bring chairs or padded blankets. Some picnic tables with seats will be available. No beverages, except water in factory-sealed bottles, will be permitted into the viewing area. Water will be available for free to fill cups or empty containers. When: Saturday, Aug. 22 from 5-10 p.m.
Members of the Portland Picnic Society will also be in attendance, picnicking amongst the crowd and offering copies of their new cookbook, “The Picnic” that feature delicious recipes and ideas for putting together the perfect alfresco meal. They’ll provide fun orange picnic tips through TriMet social media and at portlandpicnicsociety.com/blog in the days leading up to the event. Ride Portland Streetcar to the SW Moody & Meade Ave stop or bus line 35-Macadam/Greeley. • 2 Park & Rides: 318 parking spaces at SE Tacoma St/Johnson Creek Station and 401 parking spaces at SE Park Ave Park & Ride Garage and 9 EV spaces with chargers.